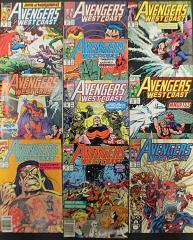 Avengers West Coast Collection - 10 Issues! The West Coast Avengers was a team that branched off from the Avengers and settles in California in order to respond to threats on the West Coast in a more timely manner. Contains issues #55, 58-62, and 72-75.